Just How Bad Is This Chicago Winter? Wind chills can add some misery to any Chicago winter. Question-asker Tracey Rosen, who asked Curious City if Chicago winters were really worse than they are now. One good thing about lots of snow? Tobagganing. On average, Chicago gets sunshine 54 percent of the time. This is not one of those times. Editor&apos;s note: This post has been updated to reflect how the 2013-2014 winter season in particular compares to seasons past. It introduces the Accumulated Winter Season Severity Index, which seeks to combine several factors that make winter miserable: temperatures, snowfall and a winter season&apos;s duration. As of March 17, the index would suggest the 2013-2014 was the third-worst since the 1950s. Additionally, the season ranks third-highest when it comes to snowfall measured from Dec. 1 to the end of February. Continue reading to see how recent decades (not just this season) compare to those of Chicago&apos;s past when it comes to temperature, wind chill, extreme events, grey skies, and city response. Maybe you’re still warming up from January’s polar vortex — replacing your car’s battery or repairing the plastic insulation taped into your window frames — but bear with us: What’s the worst part of winter? “Is it true that Chicago winters were worse than they are now?" I asked Illinois State Climatologist Jim Angel, who pointed out Tracey’s query raises questions of its own. But it depends on what you deem “worse.” Would that be a winter with more snow? One with more big snowstorms? 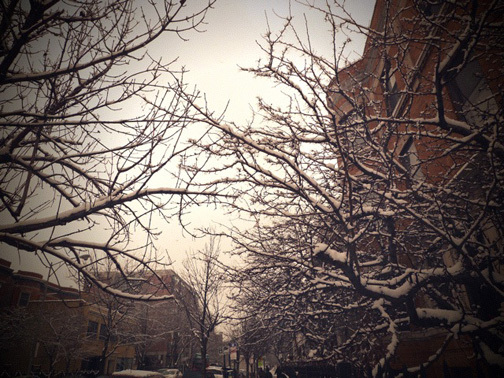 Should the coldest winter count? Or maybe one where city services like public transportation freeze to a halt? To answer Tracey’s question, we broke down some of the more universal descriptors of a “bad” winter and found out which years had it the worst (temperature, wind chill, snowfall, extreme events, grey skies, and city response). Along the way we found out what effect a brutal Chicago winter has on the people who live here and how some of them cope. But we also struck gold when we found there’ve been attempts to scientifically assign a value to each winter’s particular blend of meteorological misery; this would be one measurement to rule them all — or at least allow us to compare a snowy, but mild winter to one that was cold but had clear skies. A scientist with the National Oceanographic and Atmospheric Association researches the question we’re asking: How do you judge a severe winter? Barbara Mayes Boustead developed the Accumulated Winter Season Severity Index (AWSSI, pronounced “aussie”) to mathematically pin all of this down. AWSSI assigns points to each winter based on its daily temperature maximums and minimums, its snowfall and lingering snow depth, and its length. The index designates the "start" of winter when the first snow falls, or the first high temperature that’s 32 degrees or colder. If neither of these happens before Dec. 1, then that’s when the index starts counting. The "end" of winter is set by the last snowfall date, the last day with one inch or more of snow depth, or the last day when the maximum temperature is 32 degrees or colder. If none of these occurs after February, then the last day of February is the end of winter. 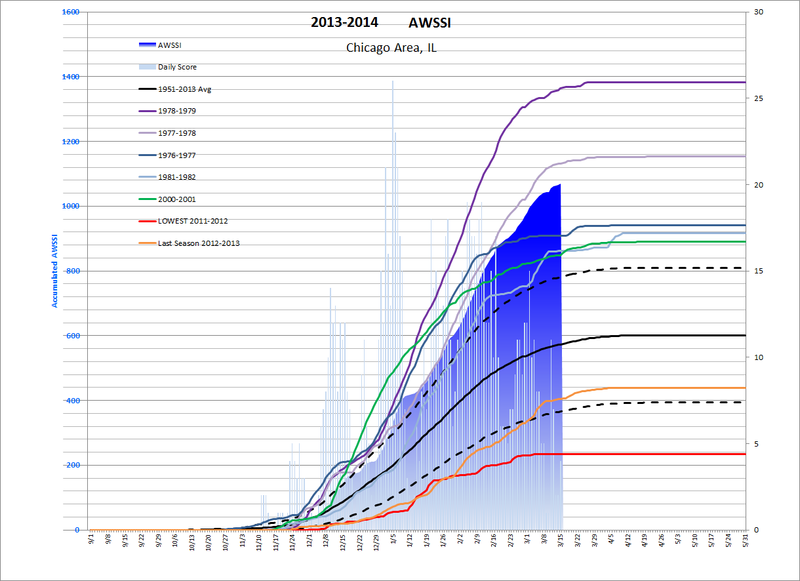 The winter of 2013-2014 “began” in Chicago on Nov. 11, according to AWSSI, with 0.4 inches of snow. That’s close to the average start date of Nov. 13, which means it’s unlikely to rank as one of the city’s longest winters — several have stretched five or six months. In 2006, winter started on Oct. 12 and didn’t end until April 12. The following chart represents the trajectory of misery within specific seasons. Read from left to right, you can see when a particular winter season began and — as the line climbs — how it performed on the AWSSI scale. This version represents only the five highest- and five lowest-ranking seasons. The blue, filled-in section represents 2013-2014, while the black line follows the average since the start of the 1950-1951 season. Statistically speaking, the AWWSI suggests that this winter is indeed "bad" compared to previous seasons; as of March 17, Boustead said, 2013-2014 ranked as the third-most severe since the 1950s. Omaha-based Boustead said she her work&apos;s inspired by the descriptions in Laura Ingalls Wilder’s Little House on the Prairie novels, particularly The Long Winter. “What I’ve been doing this whole thing for is so that I can go back to these records and add up what their AWSSI was that winter and show how severe that winter was,” she said. The green dots are the temperatures during individual winters (December-February). The red and blue areas are periods where warmer and cooler temperatures, respectively, dominated. A relatively cold period for northeastern Illinois (compared to its average winter temperature of 25.1 degrees Fahrenheit) began in 1976 and continued through 1987. Relatively mild winters, average-temperature-wise, immediately followed, from 1988 through 2006. Chicago’s coldest month was January 1977, with an average temperature of just 10.1 degrees Fahrenheit. The coldest single temperature reading, however, was eight years later. On January 20, 1985 the thermometers hit 27 degrees below zero. 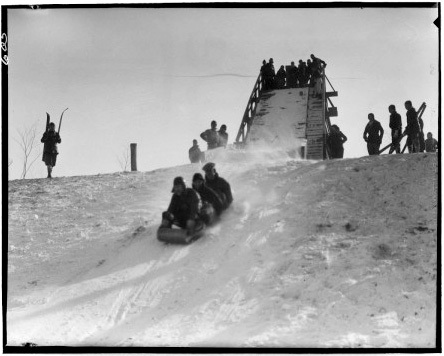 And Chicago’s coldest year on record was 1875, with an annual average temperature of 45.1 degrees. We’ve had a few bouts of persistently cold temperatures this winter, including one that approached a length not seen since 1996, when a 66-hour run of subzero temperatures became the area’s second longest. That record belongs to a 98-hour period beginning on Dec. 26, 1983. Chicago’s temperature as measured at O’Hare Airport has dropped below zero 15 times this winter, as of the end of January — that’s twice the long-term average. That puts us not far from the winter of 1978-79, when the city saw subzero temperatures 23 times. The1970s were indeed cold and snowy, enough to be a point of pride for the Chicagoans who weathered those years. Statistically speaking, though, the winter of 2013-14 could give young Chicagoans an idea of what their late 70s forbears had to deal with. Again, Barbara Mayes Boustead&apos;s “winter severity index” ranks this season — as of March 17 — the city’s third-most “severe” since the 1950s. A biting wind can make an ordinary cold night feel like a deep freeze — January’s polar vortex brought Arctic wind chills as low as 40 degrees below zero. But, Chicago’s coldest wind chill ever was -82 degrees. It came on Christmas Eve, 1983. 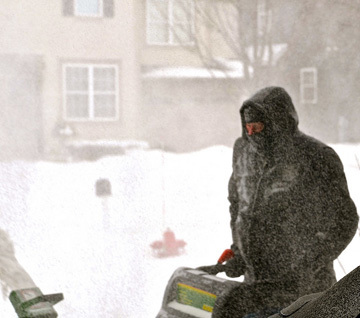 The wind in the term “wind chill” can compound a winter season’s misery. For example, gusts can make it hard to clear snow. Tim Gibbons has owned Tim’s Snowplowing, Inc. for 30 years. They’re located in Humboldt Park now, but Gibbons started plowing in the neighborhood he grew up in and still calls home — North Center. Lately wind has been making his job difficult. Chicago went 107 days with snow on the ground from November 27, 1978 to March 13, 1979. This season, it&apos;s unlikely we&apos;ll have snow in sight for such a long period. And, despite some notable snowfalls, some key operations are able to keep up. According to climatologist Jim Angel, this winter we have not gone more than about four days in a row with snow cover at O’Hare. "Of course," he adds, "some of the piles of snow in parking lots are lasting a lot longer." Just as averages can blur individual data points, looking at total snowfall can miss the difference between a quaint winter wonderland and Hoth: huge snowstorms. Since 1886, there have been 42 storms that brought 10 inches of snow or more to Chicago, said Ben Deubelbeiss of the National Weather Service. 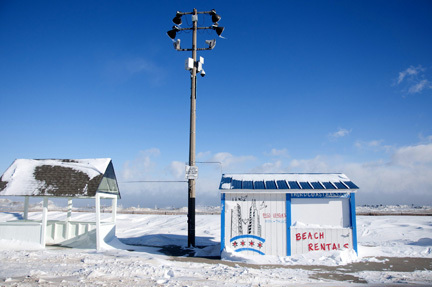 (The most recent one was in 2011, when more than 20 inches of snow blanketed the city, stranding cars on Lake Shore Drive.) Every decade has had at least one such storm, but the 1890s leads the pack with seven. The 1970s is a close second, however, with six snowstorms that dropped at least 10 inches. The 1960s were third, with five. How about individual years? It’s rare for any given year to have more than one Chicago snowstorm that big. In fact, Deubelbeiss said since NWS’ records began in 1886, only five years have had two storms with more than 10 inches of snow each: 1894, 1895, 1896, 1978, and 1970. Chicago’s single biggest snowstorm occurred on Jan. 26, 1967. At 5:02 a.m. it began to snow. It snowed all day and night, until 10:10 a.m. the next day, dropping 23 inches of snow in all. Looting broke out, some people were stranded overnight at work or in school, and 26 people died as a result of the storm. Cold temperatures and periodic snow continued for the next ten days, aggravating attempts to cleanup after the storm and get city services back to normal. All that was made a bit more shocking by the fact that just two days before the storm, the temperature had reached a record 65 degrees. Chicagoan Frank Wachowski has catalogued the city&apos;s weather data for decades, compiling its longest continuous volume of meteorological data. One thing he keeps track of is the amount of sunlight that shines each day. Of the years tracked in Wachowski’s records, 1992 had the most winter days (November through February) with no sunshine — 46 of those 121 days registered zero percent on Wachowski’s sunshine recorder. Of the 25 gloomiest years using this measure, only five have occurred since 1990. On average, Chicago only gets sunshine 54 percent of the time. That annual average has stayed about the same for 30 years, Wachowski said. In the winter, it’s even grayer. Winter months typically get sunshine less than 44 percent of the time. In November 1985, the sun only shined on average 16 percent of the time. 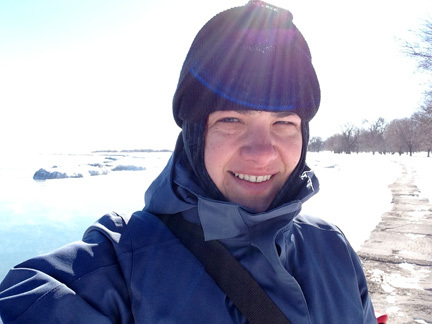 That’s not surprising to people with Seasonal Affective Disorder, like Arlene Malinowski. SAD, as it’s known by its acronym, afflicts about six percent of Americans. Malinowski’s an actor and playwright who has written about the depression that sets in during long, gray winters. But there’s a light at the end of the tunnel, literally. A lightbox can simulate sunlight indoors — a therapy Malinowski recommends along with walks or vacations, if you can take them. If you can stay warm and indoors during cold snaps and snowstorms, even extreme weather itself doesn’t throw off your schedule for more than a day or two. But when city services grind to a halt, the agony of a winter storm can go on for much longer. When 20.3 inches of snow fell on Chicago Jan. 13-14, 1979, it snarled both city streets and Mayor Michael Bilandic’s reelection ambitions.Jane Byrne went on to win the municipal election less than two months later, and the politics of snow would become associated with her term forever. New CTA lines running in expressway medians choked on all the de-icing salt. Unlike previous storms, the 1979 blizzard saw massive closures of rapid transit lines, in addition to buses, cars and flights. About O’Hare closing — Chicago Department of Aviation spokeswoman Karen Pride said while they always have staff on hand to maintain the airport, winter weather has temporarily knocked out all available runways on several occasions. There were “nearly half a dozen” such occasions in the 1970s and 80s, Pride said, but that hasn&apos;t happened since. Another major blizzard struck the Midwest in 1999, dropping 22 inches of snow on Chicago before temperatures plummeted to -20 degrees or lower in parts of Illinois on January 3 and 4. The National Weather Service ranked it as the second worst blizzard of the 20th century, behind only the blizzard of 1967. The 1999 storm was slightly larger than the one in 1979, at least in terms of snowfall, but it doesn’t carry the weight of a mayor’s political career. It did, however, set some records. Lake Shore Drive was shut down altogether for the first time in history, and Interstate 65 in Northwest Indiana was also closed. Chicago Public Schools extended winter break by two days. By Jan. 9, one week after the storm, only about half of Chicago students were back in class. Our most recent massive snowstorm — the 20.2-inch blizzard of 2011, responsible for the city’s third highest snowfall on record — shares some things with its 1999 predecessor. Chicago Public Schools were again closed, for the first time since 1999, and cars were once again stranded on Lake Shore Drive. In terms of cold and snow, generally speaking, the trend is toward milder winters. How much milder Chicago’s winters will become, and how quickly that will happen, is difficult to pinpoint. As we continue to pump greenhouse gases into the atmosphere, scientists expect the average global temperature to increase. Last year was warmer and wetter than average for the contiguous U.S., NOAA said in January — a finding consistent with climate change. Ultimately agony is a matter of perspective when it come to winter weather. Tim Gibbons of TSI Snow said it’s important to remember the good times. The 54-year-old has been around for some mighty winters, but has only fond memories of the blustery late 1970s. Now that he’s older, he admits business can be stressful during extreme winters. But he said that’s not the whole story. His advice? People should help each other shovel out their cars (he’s no fan of dibs), and remember that even the coldest winter’s only temporary. Chris Bentley is a reporter for Curious City. Follow him on Twitter at @Cementley.